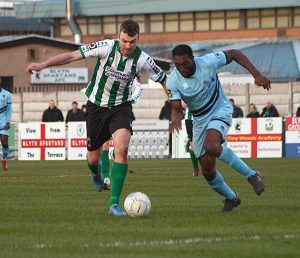 Blyth Spartans extended their unbeaten to 14 matches – but were denied all three points following a last-minute penalty save from Bradford Park Avenue goalkeeper Steven Drench. Drench guessed right from Robbie Dale’s 93rd-minute penalty to prevent the Blyth captain from marking his afternoon, which saw him become the club’s all-time record appearance holder (626), with the winner. It capped off a drama-filled last quarter of an hour as substitute Jarrett Rivers controversially saw red, minutes after Conor Branson cancelled out Sean Reid’s first-half opener. Alun Armstrong kept faith in the same starting 11 that beat National League side Boreham Wood last weekend. Blyth began on the attack as Dan Maguire powered a shot towards the bottom corner and while it looked to be heading off-target, keeper Drench was taking no chances. The hosts swiftly responded, Oli Johnson, who looked a constant threat down the left-hand side, was thwarted by Peter Jameson as he aimed towards the bottom right corner. Jake Beesley then went on to register a further two opportunities on goal for Bradford before Maguire was again denied comfortably by Drench. Park Avenue arguably edged the opening quarter of an hour, overseeing the greater possession stats, however Spartans would soon grow into the encounter. Only the inside of the left post stood in the way of Dale from marking his landmark afternoon with a goal. And while it wasn’t to be the opener, it did act as a springboard for the visitors. Because less than 10 minutes later, a beautifully weighed delivery from Michael Liddle was met freely by the incoming Reid, powering his header past the helpless Drench. The left wing was a position Blyth endured much joy in as moments earlier, Jamie Holmes’ effort across the area was so nearly slid home by Reid before Holmes himself fired a tame effort at goal. Aiming to capitalise on their advantage, Spartans pushed to extend their lead but Maguire, for a third time, was unable to really test the hosts’ goalkeeper. And Blyth had their goalkeeper to thank as they carried a slender 1-0 into half-time as Jameson, somehow tipped behind Johnson’s effort that looked destined for the bottom right corner. For half an hour in the second period, the Spartans backline had barely been tested – but a Bradford equaliser in the 77th-minute sparked the game back into life. Park Avenue breached the visitors’ defence via a Lewis Knight corner as Mark Ross, at the back post, headed onto the face of Branson on its way past Jameson. Proceedings took another turn – 12 minutes after replacing Holmes, Rivers was shown red for a challenge on Beesley, but it wasn’t just the tackle that caused the most controversy. Match official Barry Lamb had initially awarded the Blyth winger a yellow card but after consulting with linesman Darren Brown on the far side, he opted to send Rivers off. Back Blyth came, though, and were handed a golden opportunity to grab a deserved three points when Maguire was brought down in the area. But unfortunately for Dale – Blyth’s designated penalty taker – and the visitors, the spot-kick was saved and the visitors were forced to settle for a point. A slight disappointment around the result shows how far Armstrong’s men have come in recent months. Bradford: Drench, Ross, Lowe, Wroe, Killock ©, Spencer, Knight, Branson, Beesley, Johnson. Subs not used: Toulson, Atkinson, Hurst, Dawson, Nowakowski. Blyth: Jameson, Nicholson, Buddle, J.Watson, Liddle, Green, Oliver, Holmes, Dale ©, Reid, Maguire. Subs not used: Fewster, Mullen, Wrightson, Rivers, Laing.